Alcaligenes viscolactis may produce ropiness in milk with no detectable flavor change. This bacterium produces capsules in milk. 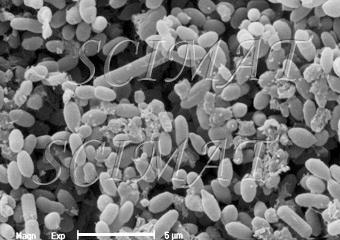 However, conventional fixation for electron microscopy (EM) is insufficient to preserve bacterial capsular material, a highly hydrated structure which collapses during dehydration and embedding. 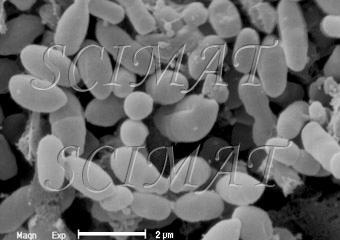 Excellent preservation of bacterial capsular material was achieved using 50 mM lysine together with glutaraldehyde in conventional embedding procedures. A combination of Ruthenium Red and lysine is an excellent EM stain for enhanced visualization of bacterial glycocalyces from cultures or from clinical specimens. The use of EM in the evaluation of bacterial glycocalyces and biofilms is described in greater detail by T. A. Fassel and C. E. Edmiston. The nature of bacterial capsules was explained and illustrated by K. Toddar. Alcaligenes viscolactis was a bacterium in the 90ties safe for experiments by junior high school students.